Kanazawa Wagasa, a Japanese umbrella is one of the traditional arts and crafts in Kanazawa. Wagasa artisan is disappearing, bacause only one aged artisan is maintaining the making skill here. A group of young artisans organize a study group to preserve the skill. 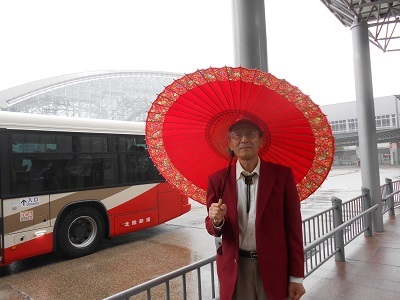 I bought the umbrella from ” wagasa minto” on a special order. About 3 months were needed to be completed. 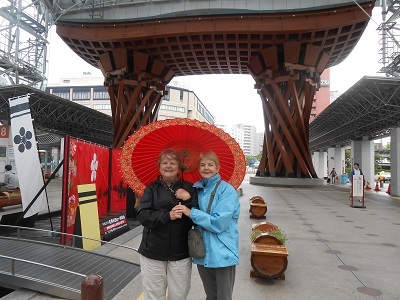 Australian sisters took a photo in front of tsuzumi – mon gate of JR Kanazawa station. I hope this umbrella add one attraction to my tour. 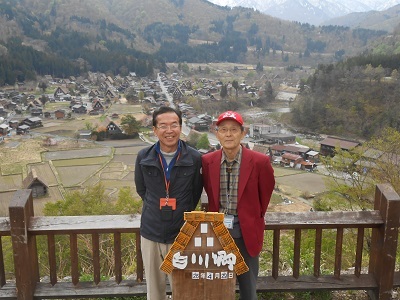 My fellow licensed tour guide and I stood at the oveservation deck of Shirakawago village 0n April 29,2014. I wore a red cap and a red jacket. Red color is very much helpful for overseas cutomers to find me in the crowded mass.